Ad # 549113 has been disabled. One of Coeur d'Alene Lake's biggest attractions is fishing. The St. Joe River is considered the best cut-throat trout stream in the entire panhandle. 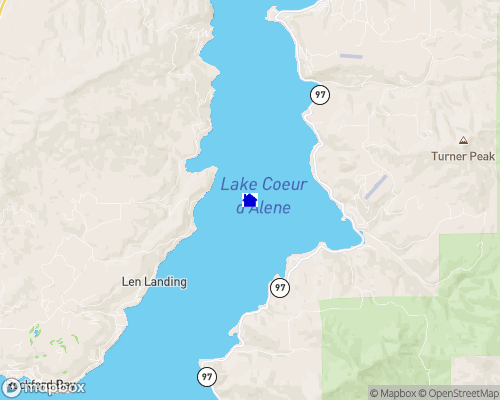 And while Coeur d’Alene Lake is also good for cut-throat fishing, it is better known for its chinook salmon. In fact, the largest landlocked chinook salmon ever caught in the state — a 42-pounder — came from Coeur d’Alene. The lake also produced the state record for northern pike at 38 pounds 9 ounces. There are numerous other species of fish to be caught, including bass, crappie, perch and other types of trout. An angler stands a good chance of catching something, but you’ll likely do better if you hire one of the local guides who knows the hot spots and feeding preferences. The lake is about 30 miles long, ranges from 1 to 3 miles wide, and offers boaters 109 miles of pine-forested shoreline and rock outcroppings to explore. Much of the boating takes place on the lake’s north side, near the town of the same name. It is also where you’ll find the spectacular gable-towered Coeur d’Alene Resort nestled against the forested Tubbs Hill peninsula that is dotted with numerous little beaches tucked in among the rocks and pines. Coeur d'Alene, like many places in the Northern Region, received its name from French traders. They applied the term, meaning "sharp-hearted", to group of local Native Americans (who had their own name, Scheechu'umsh). Fort Coeur d'Alene, later Fort Sherman, was erected in 1876. The city burgeoned around the stockade after the 1883 discovery of silver, lead and zinc, then the mining boom of 1884. Today Coeur d'Alene, population 34,514, is a recreation destination fronting on beautiful Coeur d'Alene Lake. The city also boasts grass seed farms, lumber mills and facilities that produce manufactured homes and electronic gear. Points of interest include a 3,300-foot floating promenade on the lake, perhaps the world's longest. Idaho's oldest public building, Mission of the Sacred Heart, is nearby. Coeur d'Alene, Kaniksu and Saint Joe national forests are in the area.